BeenThere-DoneThat: Snowdonia, Caernarfonshire (Gwynedd), North Wales. 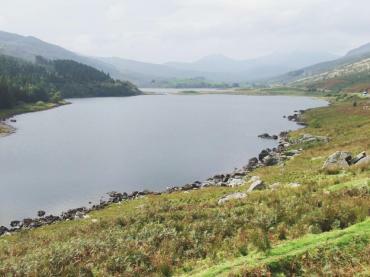 This lake, Llynnau Mymbyr, is just outside Capel Curig on the road to Llanberis (A4086). The Snowdon massif can be seen on the right half of the horizon. The obvious peak in the centre of the picture is Y Lliwedd, which is part of the 'Snowdon Horseshoe', and the Snowdon peak (3560 feet) itself to the right is enveloped in cloud. It is possible to visit the Snowdon summit by mountain railway from Llanberis. At 3458 feet high the Carneddau, the mountains on the horizon, are only a little lower than Snowdon. These mountains are part of a large expanse of mountainous country with no roads. 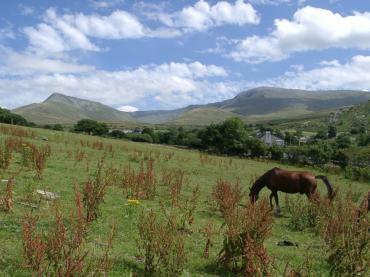 This view, from the East, shows Pen yr Ole Wen, the peak on the left, with Carnedd Dafydd on the right. 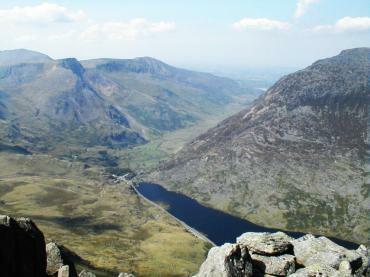 View from the top of Tryfan. This peak is next to the A5 and it is possible to park in a nearby layby and climb to the top. At 3010 feet high it affords magnificent views in good weather. 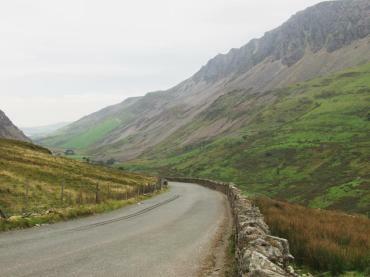 The A5 can be seen, together with the layby, next to Llyn Ogwen (the lake) and beyond the lake is the Nant Francon valley. The crags on Mynydd Mawr (2268 feet) seen from the B4418 which runs due west from the A4085 north of Beddgelert. This road does not go anywhere special but it is worth traversing it from the eastern end just to see the changing views of Mynydd Mawr. If you were to drive from the western end you would have to be looking backwards all the time to see the views. The road is winding and narrow in places but there are a few points where a car could be parked.